For the prevention of large and small Strongyles, pinworms, and ascarids in horses. Alfalfa and molasses-based pellets help ensure eager consumption and can be top dressed or mixed into any feed. 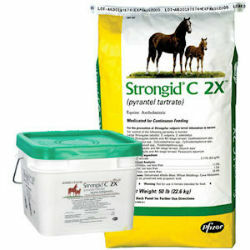 Concentrated Strongid C 2X requires 2 ounces daily per 1,000-pound horse. For use in horses and ponies, including breeding mares, stallions, and foals six months and older. Options: 10 lb. 50 lb.